PepsiCo today released today the details about the Pepsi Super Bowl 2012 ads. 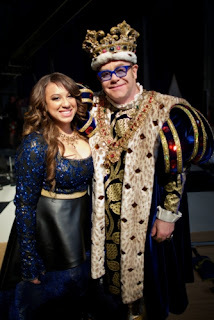 The new Pepsi ad titled "King's Court" features Melanie Amaro, THE X FACTOR 2011 winner, singing for multi Grammy-winning music legend Sir Elton John who plays a "king of rock" in the commercial. The Pepsi Super Bowl 2012 ad was produced by TBWA/Chiat Day and directed by Noam Murro. During the commercial, Amaro performs a song she recorded exclusively for the ad, a contemporized version of RESPECT, by Otis Redding, and made popular by the "Queen of Soul" Aretha Franklin. Pepsi fans who "Shazam" the spot during the big game will be able to view Amaro's music video for RESPECT. Set in a rock-fantasy version of medieval times, the 60 second commercial features Melanie Amaro performing in front of a "royal court of rock," including Elton John's character, the King. The ad establishes Pepsi as the brand for people who are not afraid to take a chance, raise their voice and give it their all. It also highlights the fact that Pepsi has an irresistible taste worth challenging a king for. With epic Pepsi scale and a big dose of humor, the commercial ends with a twist and the tagline, "Where there's Pepsi, There's Music". "Pepsi wanted to make me 'King for a Day' on Super Bowl Sunday. How could I possibly pass that up?" said Sir Elton John. "For decades, Pepsi has showcased musical talent in its commercials on television's biggest stage - the Super Bowl," said Simon Lowden, CMO, PepsiCo Beverages Corporation. "This year's spot takes our legacy to the next level by spotlighting a rising pop artist alongside a music legend and engaging fans on a deeper level through powerful digital programming." Amaro's appearance in Pepsi's Super Bowl XLVI spot is part of her historic grand prize win on FOX's, THE X FACTOR. The deal also includes a $5 million recording contract for the winner, making it the largest guaranteed prize package in television history. "Never in my wildest dreams did I ever think I would be starring in a Pepsi Super Bowl commercial, following in the footsteps of some of music's biggest legends," said Melanie Amaro. "Winning THE X FACTOR has changed my life," she continued. In addition to the Shazam offering during the big game, Pepsi will enhance the fan Super Bowl experience through integrated digital programming. Highlights include: an NFL-themed version of Pepsi Sound Off, the first brand-led social TV platform, which was launched during THE X FACTOR to engage consumers in a real time viewing party with celebrity hosts. Digital programming also extends to a partnership with Pandora providing fans with a Pepsi-curated Super Bowl-themed station to listen to before, during and after the game. Lastly, a partnership with social network, Get Glue, which allows users to check-in and unlock exclusive content and free Pepsi. The Pepsi Super Bowl ad titled King's Court is one of the two commercials PepsiCo plans to air during the Super Bowl 2012. Pepsi MAX, the official soft drink of the NFL, will also debut a commercial on this year's Super Bowl, featuring legendary television personality Regis Philbin. Watch a behind a scenes video of the making of the Pepsi King for a Day commercial.